Forget Facebook updates and tweets, the in-car feature that will really keep you gliding through the gridlock is a coffee maker. Probably. Give it up, therefore, for the Fiat 500L, the world's first car with an optional coffee machine. 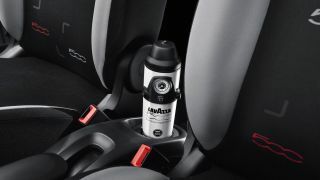 Cooked up by Italian coffee specialist Lavazza, the "Espresso Experience" kit will cost around £200 and involves a specially-designed flagon with an integrated heating element located between the front seats. Water is heated and then passed through custom coffee pads before collecting in the upper reservoir, from whence you pour yourself a cuppa. Technical stuff, clearly, this coffee making. No word yet on exactly when you'll be able to cook up a brew in the UK. But for the record, the 500L is Fiat's uglified and MPV'ed five-door version of the uber-popular 500 city car. It's just about to go on sale in the UK and the 1.3-litre, 84hp diesel version is yours for roughly £15,500. Depending how you look at it, that's either a competitive price for a compact MPV with Italian pizzazz or one hell of a bill for an oversized bean percolator on wheels. Watch the not-exactly-overly-informative official video below.